Cardi B attends the 61st Annual GRAMMY Awards at Staples Center on February 10, 2019 in Los Angeles, California. In the history of iconic glow ups, reality proved far more fantastical than fiction Sunday night at the 61st Grammy Awards ceremony, where the accomplishments of the many queens in attendance put fairytale princesses to shame. And then, there was Belcalis Marlenis Almánzar, the regular, shmegular, degular girl from the Bronx who made history last night as Cardi B, the first solo female artist to win Rap Album of the Year. The win itself should cement Cardi’s status as more than a pop cultural blip for those still holding out on giving the woman her due (granted, many of these same people are climate deniers, so there’s that). 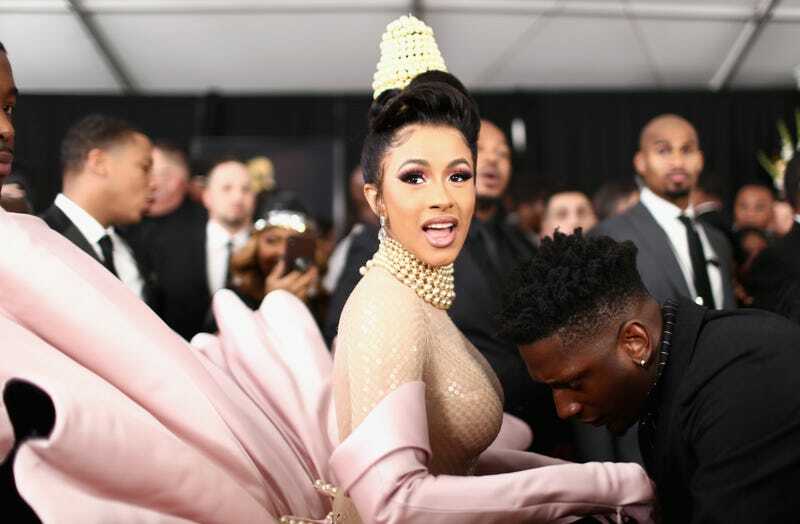 But from the red carpet to her surprisingly PG-rated performance of her most recent hit, “Money,” Cardi’s looks garnered comparisons to another internationally-known female icon of color, Josephine Baker. And both have a deep commitment to motherhood; Baker as the adoptive mother of a culturally-diverse “rainbow tribe” of children, and relatively new mom Cardi as a new-millennial prototype for what working motherhood can look like. For instance, despite her tremendous win on Sunday night, the superstar would likely admit the moment was eclipsed by daughter Kulture, who turned seven months old on the day her mother made Grammy history. After thanking her daughter in her emotional acceptance speech, Cardi returned home to hear Kulture say—actually, sing—“Mama” for the first time. Having been open about the challenges, unconditional love and newfound patience and drive she’s gained as a mother, moments like these undoubtedly make it more than worth it. Other tools in Tokyo’s beauty bag (and on Cardi’s head last night)? Suave Professionals Anti-Frizz Smooth & Shine Cream and Firm Control Finishing Spray, and Suave Professionals for Natural Hair Shine Serum Gel. And then there’s the pro favorite, the Dyson Supersonic Pro Hair Dryer, which set those perfect fingerwaves in place, prior to Cardi’s performance. But of course, Cardi wasn’t the only one to watch on the Grammy telecast last night. From the still barefaced beauty of Alicia Keys to the shades-wearing glamour of H.E.R., the 2019 Grammys were ripe with beauty and fashion inspiration... and no shortage of black excellence. Alicia Keys (l) hugs Michelle Obama, who is wearing custom Sachin and Babi. Nazanin Mandi (l) and Miguel. Future (R) and his mother. (L-R) Yolanda Adams, Fantasia Barrino and Andra Day perform a tribute to Aretha Franklin.